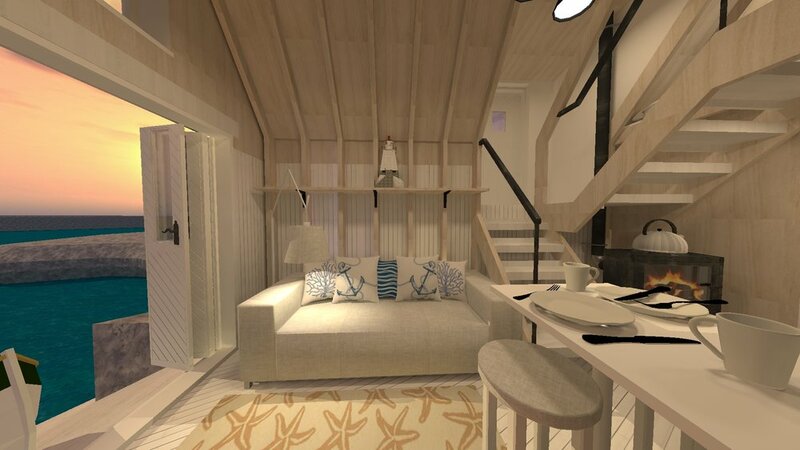 It's fair to say that many of the design clues for this boathouse are similar to last months Norwegian Tiny House. And indeed, the interior does use a lot of the same furniture. The lounge furniture and kitchen furniture are basically the same, and the materials used are still similar. I have however started to make my own furniture rather than relying on stuff I've found in Sketchup's Warehouse feature (a community tool where people upload their own models for people to use). So things like the log burner, cooker and all the doors are things I've made. I'm hoping eventually to build up a set of my own models for me to use in future designs, which would allow me to make my 3D designs a lot quicker. I will try and mix up the aesthetic between blogs, but where there is a running theme it's not always suitable (such as with this Norwegian theme I have at the moment). I have however tried to deviate slightly from last months aesthetic by introducing more materials, such as the cast iron railings and industrial style lamp fittings. 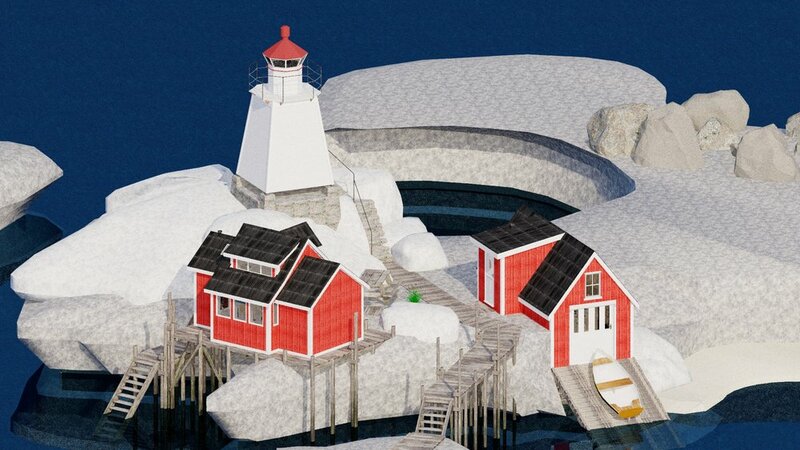 I've also put a little more effort making the whole design fit into a feasible fictional scene - so not only have I introduced this model into last months scene, but I've also built a lighthouse (based on one at Laukvik that I thought was rather adorable in its diminutiveness!) and perched it up high on a rock to give a real setting to this model. It's probably the most basic overall design I've done for these blogs! Just a standard pitched roof on a rectangular building. Well, there is the entrance porch extension, but for the most part it's a very simple design. It's another case of not wanting to deviate too much from the prototype, and since traditional boathouses/barns were built only out of what could be found in the area, I think simple is the order of the day. So, from the entrance the building looks like a traditional barn, albeit instead of the ramp up to the top floor, the ground is built up to match the door threshold; the rest of the building having been sunk into the rock. This is only because of the fictional location I've sited the building on - if you had a bank with a gentle slope, a more typical bridge could be installed, with log storage underneath. As you move towards the waterside, you begin to see the boathouse side of the building. The large wooden slipway is immediately obvious, as is the large 4 panel sliding/folding door. Made in a traditional herringbone pattern, each wooden door also features a half-height glass window on the top section, to admit natural light. 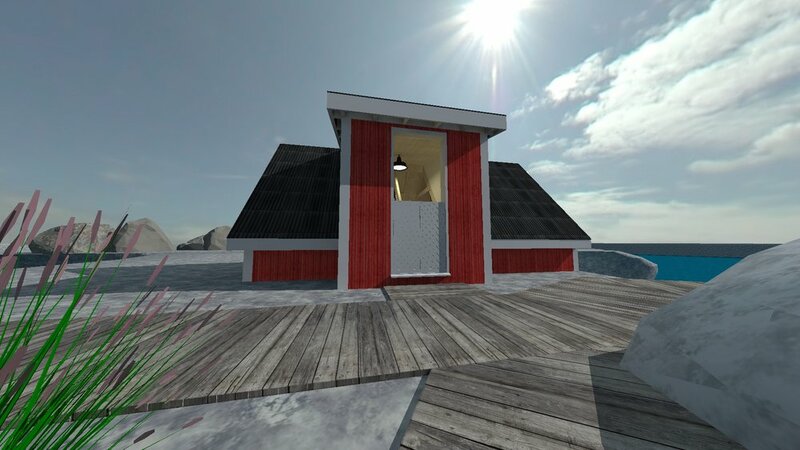 However unlikely in the prototype, I didn't want the huge set of doors to be without windows in this design, especially since it is now living accomodation rather than just a place to store a boat and related equipment. The 4 pane window above is typical of such structures, and really helps to give it a Norwegian cottage feel. It's unusual for glazing in traditional structures not to have glazing bars, particularly in older buildings. As you enter the front door, you're presented with a set of stairs; the left taking you up to the attic bedroom, whilst the right takes you down to the rest of the house. It's always good to have a little porch area to put footwear and hang coats up, and whilst I haven't shown it, you could easily add coat hooks and perhaps a small shelving unit for shoes. Anyway, we'll head up to the attic first. It's a small space with limited headroom, but that doesn't make it a place you wouldn't want to hang out. 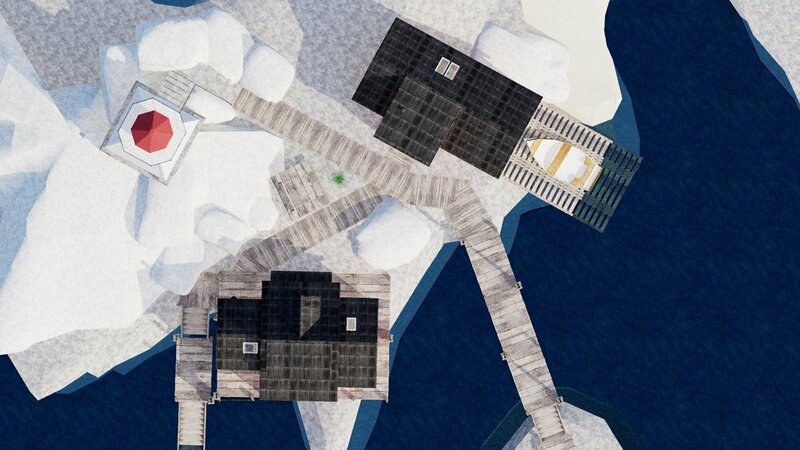 As previously mentioned, the two skylights bring in loads of natural light, and since this is supposed to be on an island in the Lofoten region of Norway, you'd have a damn good view out of them too! Similarly to the Norway tiny house from last month, there is a shelving unit on the end gable wall for storing all of your clothes. As we move downstairs, you'll note the simplistic wrought iron handrail and open stair risers. If you wanted more storage in the house, it would be easy to change the bottom set of steps into drawers, and indeed it would make for a great use of the otherwise wasted space. Whilst we're on the subject of stairs, under the top half of them sits the large log burner - a staple of my designs. On the far right is a lift-up/drop-down section of worktop. When lifted up, a locating batten (located on the wall framing) swings up and locks in place via a peg, holding the lift-up section in place. This section then hinges open to form a table area, with a leg (resting on wall brackets to the right of the TV when not in use) that locates into a socket on the floor to support the table. Bar stools (stacked on top of each other when not needed) can be pulled across to form a comfy dining area. Moving onto the lounge, the obvious major feature here is the large folding/sliding door that would provide lovely views when pulled open. Much like last months tiny house, repurposed piping forms a shelving unit above the TV. As always seems to be the way, despite spending many hours on this design, I've thought about a much better idea here. You'll note the couch is pretty far from the coffee table. What would be far better is if the TV sat on just a shelf (the same size as the current coffee table), with a rolling coffee table able to be pulled out from underneath it - basically like those stacking coffee tables you get, but on wheels instead. Anyway, back to storage, and there are loads of wall cabinets that form a continuous connection to the kitchen, making the room feel much larger than it is. 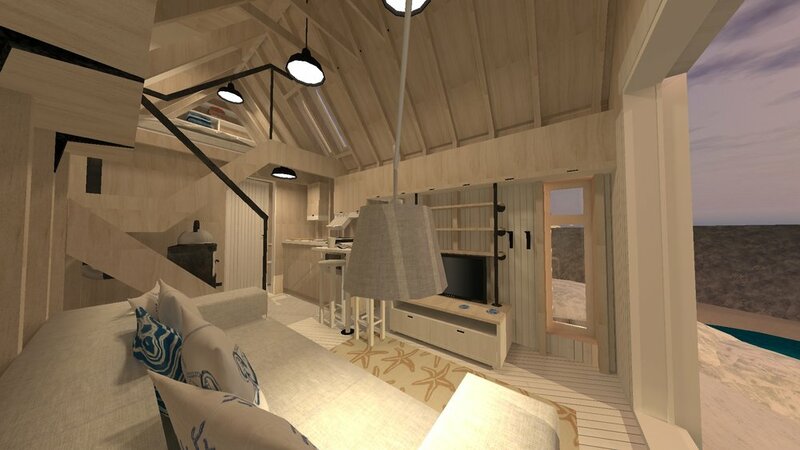 What also helps in this regard is that the ceiling is double height - thanks to leaving it open to the rafters. Originally I had a small upper loft area, but decided against it since access to it would be awkward. In the end, it has made the space feel so much bigger without it, so what's lost in storage is gained in comfort. Elsewhere, I've assumed that the sofa would be a sofa bed, so there is still room for guests to stay for a couple nights. A shelf on the wall behind the sofa makes for a nice place to store knick-knacks, and a cable-stayed lamp gives you movable lighting for whatever you're doing. And so onto the final room, the wetroom. I'll start off by saying that, in its current setting, the window should probably be frosted glass. That being said, if the ground level outside was lower, normal glass would be fine. Anyway, the usual spacious shower is the order of the day (I'm a sucker for big showers). Unusually though (despite it being useful in tiny houses) I've shown a toilet/wash basin/cabinet combo, rather than having them seperate. Not only does this save space, but I feel it also looks far neater. A large mirror and upper cabinetry finishes off the bathroom. With a few small adjustments, I think this would make for a great little conversion project in Norway. With hundreds of thousands of such boathouses, I doubt it would be hard to find something suitable, especially given many buildings now lie unused thanks to the vast improvements to the road network. It also occurred to me that (minus the porch extension) the building looks like a garage, so even if you don't live in Norway and have a disused boathouse to hand, why not convert your garage that, let's be honest, probably hasn't had a car in it for decades! Anyway, I hope you all enjoyed this month's blog entry! As usual, if you have any ideas of tiny spaces you think I could design, or any comments or suggestions, feel free to leave them below. Or, you can email me using the button at the top of any page. Industrial shelving - Katia M.
Industrial lights - Celeste H.
Chopping board - Jonny H.
Conduction hob - Gromit W.
Fire wood - Tommy K.